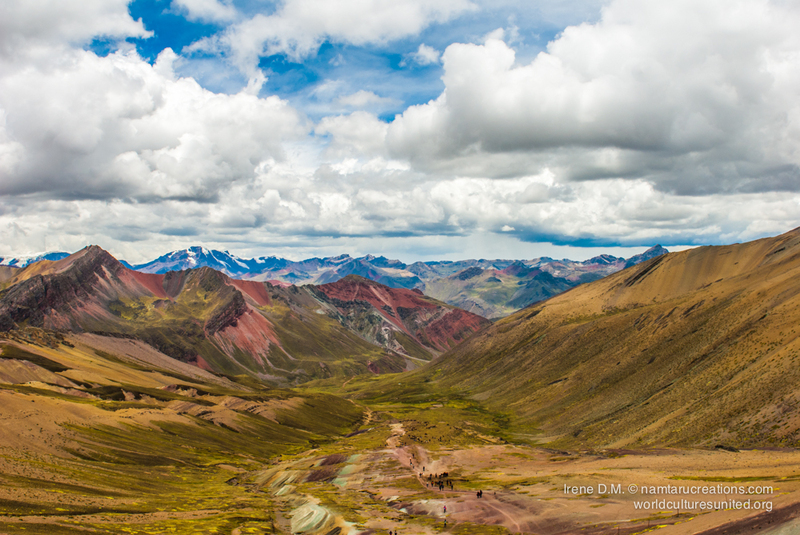 During our second trip to Peru in the autumn of 2016, we were so inspired by all photos we have seen around from the famous “Rainbow mountain” that we found our way to get there through a local travel agency we highly recommend: Peru Nature Treks. There is no picture than can describe the real experience of being present there and, further than the arrival to the mountain top, there is a whole journey to get there that becomes a personal challenge for every person that visited this wonder mountains. If you can maintain the oxygen in your lungs between 4000 and 5200 mts above the sea level, this is one of the most magical colorful experience you can find in the Peruvian Andes. Vinicunca Mountain, more known as the rainbow mountain or seven color mountain, is a magical place where you can find roads from the Quechua time. Located in the province of Quipicancha, Cusco region and Vilcanota mountain range, these roads were used for products exchange together with other roads (4 Quechua regions). The amazing coloration is due to the presence of sedimentary stones in erosion. Our trek took 3 hours to get to the mountain top and 3 to get back. We bought our 10 soles official entrance tickets on our way. During our tour, we could enjoy the amazing natural colors, textures and shapes in the landscape, including a small farming village and native quechua communities carrying horses and tourists in their horses as a paid service for those unable to walk the journey to the famous rainbow mountain. It was normal to see llamas, vicuñas and local people wearing traditional dresses and sandals on our way. 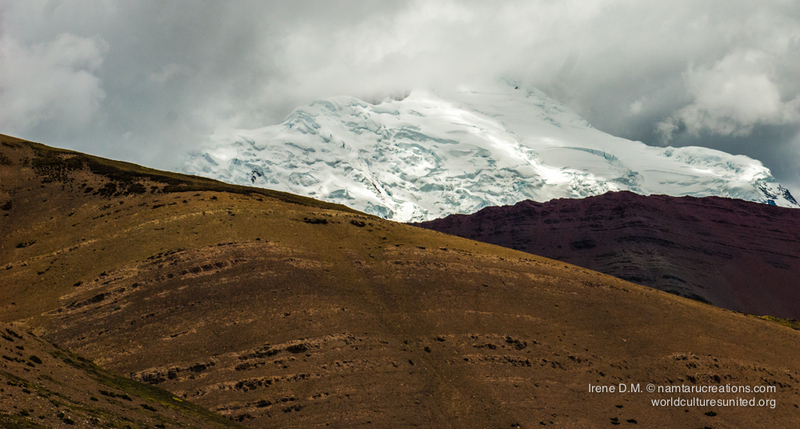 Towards the arrival to Vinicunca we could see the majestic pikes of the great “Apu” Ausangate, the second highest mountain of Peru, fully dressed in white snow at 6384mts above sea level. We shared our journey experience with beautiful people from different countries, like Argentina, Uruguay, Italy, Spain, New Zealand, Germany and Switzerland. 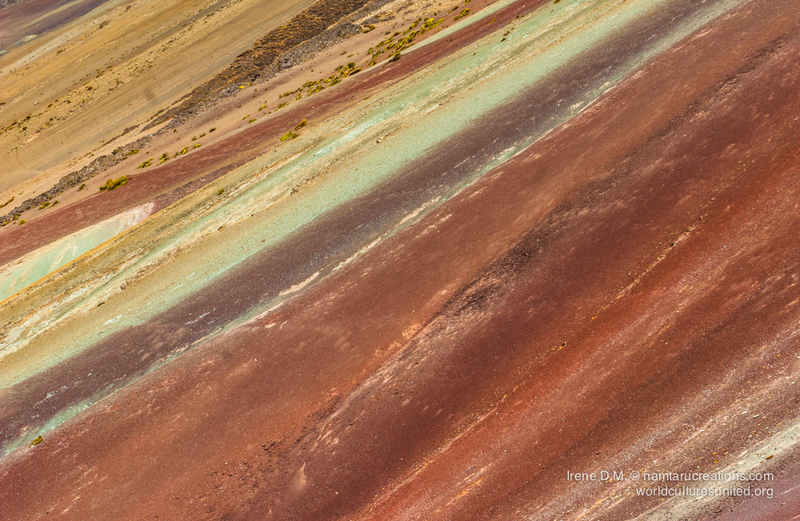 Seven natural colors and one human challenge: Vinicunca.